May 10 - afternoon, open workshop with Sir Colin Davis rehearsing the Chamber Orchestra Anglia in Elgar's First Symphony (free! ): evening - Stravinsky project, Britten Sinfonia make the music and Michael Clark Company dance a double bill of music by the master ending with Les Noces sung by New London Chamber Choir. 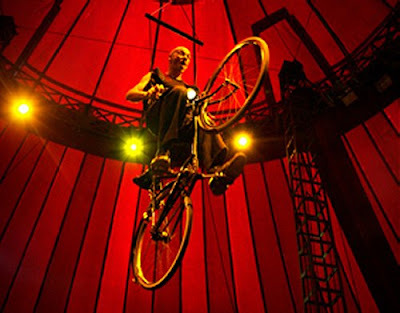 May 13 - cutting-edge circus performance, live music and video from NoFit State Circus, seen in my header photo. May 16 - Barcelona Sunset, Catalunyan contemporary dance company Erre Que Erre bring film, live music and dance, includes music by the Beach Boys, Tina Turner and Kraftwerk. YouTube sample here. May 17 - Jordi Savall & Hesperion XXI in Orient-Occident in the 15th century church of St Peter Mancroft. And I haven't mentioned the Hilliard Ensemble, King's College Cambridge Choir, Willard White and many more Festival visitors. Can it get any better? - the full Norfolk & Norwich Festival programme is here. Amid all the excitement don't forget Jacobus de Kerle's Missa Pro Defunctis and James MacMillan Veni, Veni, Emmanuel on Future Radio on Sunday May 11 at 5.00pm UK time and 12.50am May 12. More summer in the city here.